CIMB group chief executive Tengku Datuk Seri Zafrul Aziz holding the CIMB Classic trophy at a press conference today to announce the extension of CIMB Group's title sponsorship of the CIMB Classic through 2020. 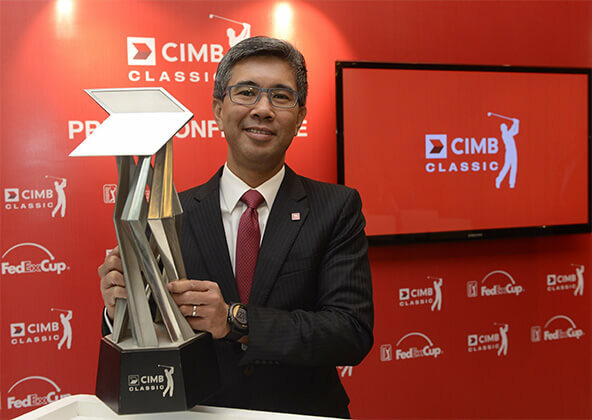 KUALA LUMPUR (Aug 16): CIMB Group, the title sponsor of CIMB Classic since its inception in 2010, today announced the extension of its sponsorship of the golf tournament through 2020. CIMB said the four-year extension reflects the success of the only official PGA Tour FedExCup event in Southeast Asia, which is also the richest in the region with a purse of US$7 million (RM27.95 million). Since it was first staged, the banking group said the tournament has attracted world class professionals like Tiger Woods, Henrik Stenson, Adam Scott, Sergio Garcia, Ernie Els and Ryo Ishikawa. "CIMB Classic, being one of most prestigious and biggest sporting events in the region, has undoubtedly boosted Malaysia's position as a golfing tourism destination, attracting an audience from all over Asia annually," it said in a statement. "CIMB Classic has firmly placed Malaysia on the PGA Tour calendar, and we are pleased to continue our title sponsorship of the tournament, which has grown from strength to strength over the last six years," CIMB group chief executive Tengku Datuk Seri Zafrul Aziz said at a press conference today. "Today's announcement is a clear demonstration of the group's appreciation to PGA Tour and our firm commitment to further develop CIMB Classic into a top golf event not only in Malaysia but also in Asean. The tournament continues to generate quite a following and we will continue to deliver an exceptional experience for players and fans alike," he added. PGA Tour commissioner Tim Finchem said since its inception six years ago, CIMB Classic has established an important international presence for the PGA Tour during the early portion of the FedExCup schedule. "I had the opportunity to attend the CIMB Classic last year and was very impressed not only by what I saw, but by the potential it has for future growth," said Finchem. "We are thrilled that CIMB will continue its sponsorship and we look forward to working with CIMB on continuing and strengthening our successful presence in Malaysia," he added. CIMB Classic was introduced in 2010 as an unofficial event before becoming a FedExCup tournament in 2013. Co-sanctioned by the Asian Tour and Professional Golf Association of Malaysia, it is held at the Kuala Lumpur Golf and Country Club and features a limited field of 78 players. Qualifiers include the top 60 available players from the previous season's FedExCup Points list, the top-10 available money leaders from the Asian Tour Order of Merit and eight sponsor exemptions, which include two Malaysians. Justin Thomas of the United States is the reigning champion. The upcoming CIMB Classic will be held on Oct 20–23 and is the second tournament of the 2016–17 PGA Tour schedule.